Harvest Moon has always been one of my favorite series. What's not to love about a simple life on the farm? You get to grow some food, raise some chickens, and milk some cows. Between tending to the crops, you can explore the town, meet new people, and even fall in love. If you're anything like me, though, that last part can be kind of awkward. You see, I'm gay, and there are a lot of gay gamers like me out there (we even have our own convention which I only found out about recently). 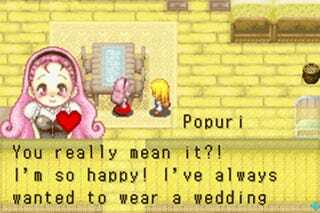 As enjoyable as this game can be, there's a bit of hollowness that comes with marrying and raising a child with an NPC you didn't fall in love with. I'm sure some "gaymers" out there might have more real life experience with that than I do. For the last year or so, I've been working on a rather ambitious project. 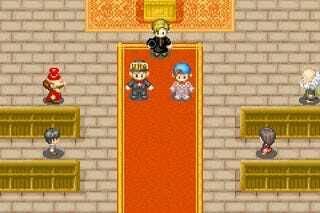 Harvest Moon: Friends of Mineral Town and Harvest Moon: More Friends of Mineral town on the Gameboy Advanced are arguably some of the best harvest moon games out there. With a bit of ingenuity, a hex editor, and a ton of elbow grease, I was able to swap the player character sprites between the two games. This means all you farm-girls can finally date and marry one of the lovely ladies of Mineral Town, and all you farm-boys have a chance to find love among the town's strapping young bachelors. 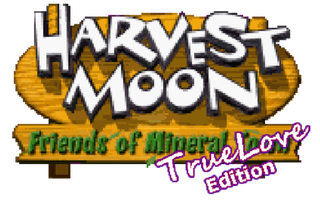 I call the mod Harvest Moon: True Love Edition. I don't mean much by the title, though I did get some push-back about it from some people early the in process. It's just that I'm finally able to play this game and marry my "true love", rather than settling for the choices the game made for me. The mod isn't perfect. There may be a few peculiar edits to the script to replace some pesky gendered terms that I might have missed. You will still have to deal with that really awkward male-pregnancy/immaculate-conception scenario. I'm not changing that on principle. This project is important to me on a very personal level. I love the Harvest Moon series, but struggled for the opportunity to play the game the way I wanted. I felt that if I really wanted a game where I can be myself, where I am allowed to make the choices I wanted to make, I would have to take it upon myself to make that happen. 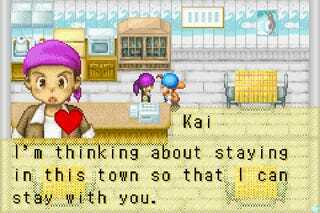 Falling in love is my favorite part of any Harvest Moon game, and for the first time, everything feels right. If you're interested in playing, you can get the game right now. Updates and bug fixes are all tracked through my Tumblr account, and you can contact me there as well. Just follow the link below, and I hope you enjoy falling in love.